We believe it is our responsibility to use our talents, resources and passion to improve the lives of those we serve. The most meaningful reward from doing our job well is offered back to us when we pour into our clients, our team, and our community with the spirit of service before self. This attitude is reflected in each of our four Core Values. We take great pride in recognizing and celebrating individuals who regularly demonstrate these values during our mid-year and year-end company outings. 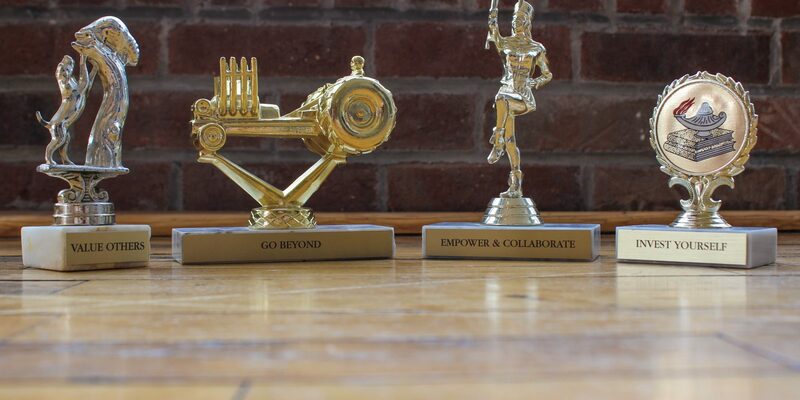 Through peer nominations and votes, we honor commitment to our culture in the form of vintage trophies — and lots of fun. Am I exceeding the expectations of our clients and our company? Am I demonstrating excellence and achieving exceptional results? 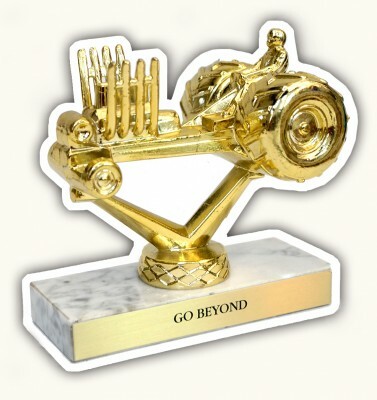 Our “tractor pull” trophy represents the personality it takes to reach the finish line. You have a lot of horsepower, you sometimes get a little dirt in the face, and you may blow a gasket or two along the way, but through it all you are constantly driven to excel. Am I all in with our company’s mission, vision and goals? Am I improving myself to add value to my team, family and community? 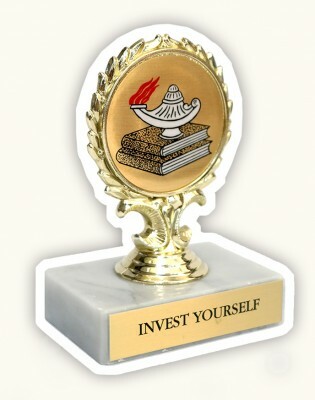 Our “lamp of knowledge” trophy represents the success that comes from serving at your best, be it through book smarts or street smarts. You utilize every opportunity to support and reinforce our vision by improving yourself, your team and your family through the pursuit of knowledge. Am I recognizing and rewarding my teammates for their accomplishments? Am I encouraging and supportive of others who need it? 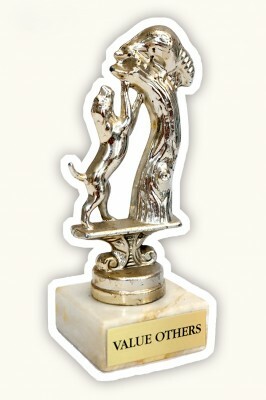 Our “animal pals” trophy represents the love a true family shares. We often spend more time with each other in our studio setting than we do with our individual families, so it’s critical that we nurture our office family with a pat on the back when earned, or a kick in the pants when deserved. Am I mentoring, inspiring and delegating to others? Am I leveraging the talents and skills of my teammates to solve problems? 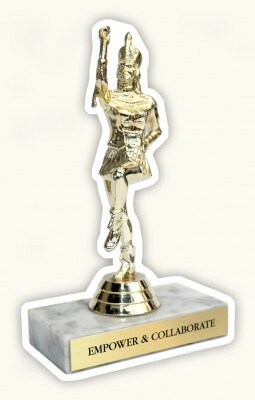 This vintage “band leader” trophy represents what great leaders at any level do. They embrace talent, empower others to do great things and lead by example. They are often the first to give accolades to others when working collaboratively and the first to volunteer for anything. 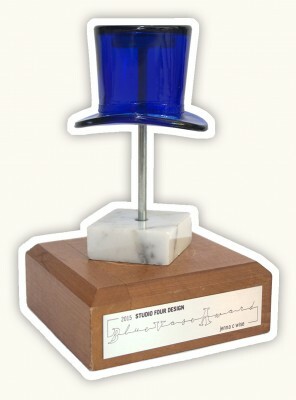 So what makes the Blue Vase Award so meaningful to our culture? As a vase, it’s not large enough to hold the prettiest bouquets. It’s not crafted by a famous designer. It’s not what you’d expect an award to look like. In the 1921 parable The Go-Getter, the character’s task was to deliver a Blue Vase. Facing one obstacle after another he grew in belief of his purpose, and his success was rewarded beyond all others who had tried before him. We recognize leaders come in many forms, and every member who joins our team reads this book to help inspire success at every level. At our annual Christmas party, the Blue Vase Award –which reimagines the simple vase as a tophat- is presented by the partners to the team member who has most embodied our values in the pursuit of excellence.